Tripoli is now teetering on the precipice of a large-scale conflict that could trigger major unrest in the Western region and Libya as a whole. Last week’s violence erupted on 27 August when the 7th ‘Liwa’ from the town of Tarhuna (otherwise known as the Kani or Kaniyat militia) declared war on Government of National Accord (GNA)-affiliated militias, advancing quickly in south Tripoli. 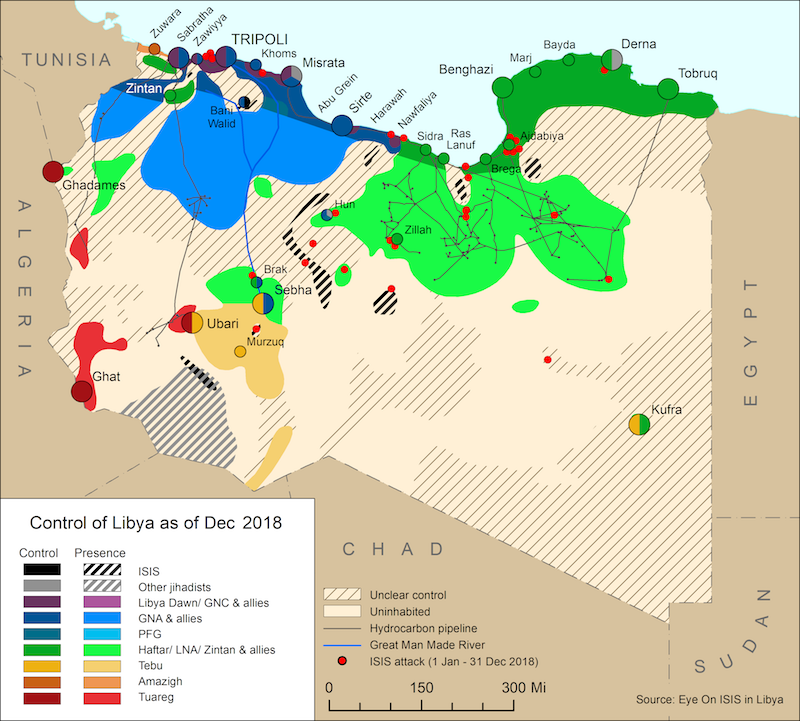 The effort expanded over the following days into what seems to be a semi-coordinated military campaign aimed at eradicating the power of Tripoli-based militias, by an alliance of forces primarily including Tarhuna, Misrata and Zintan. As of 4 September, the initial advance of the Kani brigade and allies into areas of southern Tripoli had been significantly slowed, but some fighting was ongoing. UNSMIL held a meeting on 4 September with all involved parties to try and reach a ceasefire agreement. In a statement published late on 4 September, UNSMIL said that a ceasefire agreement was reached by all parties to end all hostilities, protect civilians, safeguard property and reopen Mitiga airport. 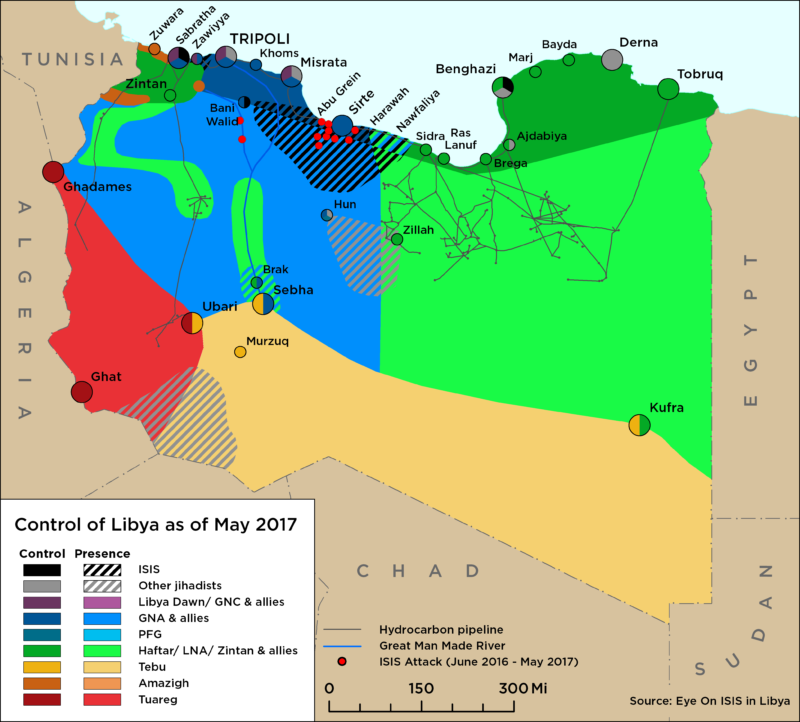 There are five main GNA-affiliated Tripoli militias – the Tripoli Revolutionary Brigade (TRB), Abu Salim’s Central Security Brigade (Abdulghani al-Kikli aka Ghneiwa’s militia), the 301 Brigade, the Special Deterrence Forces (Rada) and the Nawasi Brigade – more recently referred to as the ‘Tripoli Cartel’. These militias’ expanding grip over political, economic and security levers in the capital over the last 2 years is likely the key trigger for the military campaign against them by other forces in the western region. Although Misrata and Zintan fought on opposite sides of the 2014 Dawn-Dignity conflict in Tripoli, in May this year the three cities signed a peace agreement and have long been suspected of planning some sort of move on the capital to wrestle away the Tripoli cartel’s monopoly over state resources, infrastructure and political clout (through the GNA). The Kani brigade has been primarily fighting against the TRB, Gheniwa, and the 301 Brigade, as the areas of southern Tripoli it has advanced into are controlled by these three militias. The Nawasi brigade (which controls the port and other areas of central Tripoli) and Rada (which controls much of eastern Tripoli including Mitiga airport) have also deployed some of their fighters to the frontline with the Kani brigade and allies in southern Tripoili, although Rada has prioritised protecting its prison at Mitigia. On 1 September, the Bunyan al-Marsus (BM) forces and the Misratan Counter Terrorism Unit (CTU), both formations established by the GNA, deployed to Tripoli in large numbers at the GNA’s request to help secure Tripoli, especially the prison housing ISIS prisoners run by Rada. So far, these forces do not appear to have joined in the fighting against the Kani brigade or Badi’s forces. Indeed, the CTU force is reported to be currently camped in Tajoura with Rada’s rivals (Rada and Tajouri forces have a history of rivalry and clashes). Cooperation talks between CT and Rada are said to be fragile and could collapse if a ceasefire arrangement is not reached. Interestingly, on 1 September Mohammed El Haddad, the GNA’s Military Commander of the Central Region from Misrata, was said to be abducted in Misrata, before remerging late that night from an alleged kidnapping. Al Haddad’s disappearance prevented him from undertaking the task of leading a ‘peacekeeping’ force that would ensure a ceasefire between all the forces. The GNA-aligned Zintani forces under the command of Emad Trabelsi have also reportedly been instructed by the GNA to protect key infrastructure and sites in western Tripoli, but it remains unclear what their role is. Again, it appears they have not joined the frontline against the Kani brigade. The Amazigh Mobile Force in western Tripoli has also reportedly mobilized ready to defend their area, but have not yet joined in the fighting. On 2 September, the GNA’s Ministry of Justice confirmed that 400 serious criminals had been broken out of the Ruwaimi prison in Ain Zara, where some of the fighting is happening. No one has claim responsibility for this move. It appears both sides have been using heavy weaponry including mortars and missiles, with projectiles often landing in heavily populated residential areas far away from the fighting. As of 4 September, the Tripoli Ministry of Health figures report said there have been 50 deaths and 138 injuries so far as a result of the clashes. Fighting has also damaged key power and fuel infrastructure, triggering widespread looting, shutting down major markets, raising prices and proliferating rival checkpoints which threaten security and mobility in vital areas around Tripoli. As well as the fighting itself, different factions and militias have been quick to blame other parties for the damage and death caused by the ongoing fighting and irresponsible use of weapons.